Winter weather giving you chapped lips? The combination of cold, windy weather outside and dry, heated air inside can definitely dry out your lips. Before you reach for that chapstick, follow our tips to repair and prevent chapped lips. 1. Stop licking or biting your lips! It's a hard habit to break, but licking your lips actually depletes natural moisture due to enzymes in your saliva. 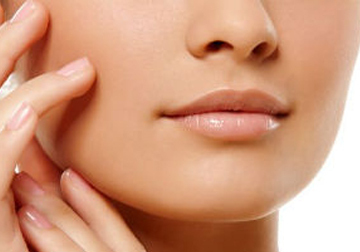 Biting your lips to help remove the dry flakes can damage healthy skin cells too, which can lead to scar tissue. 2. Drink more water! Hydration will help reduce dryness. Also, a lip balm will have better results if applied to moist lips. So take a sip, then apply your balm to seal in the natural moisture. 3. Pay attention to what you eat and drink! So we're not going to tell you to stop eating or drinking acidic foods and drinks, but at least pay more attention when you do. These acids can decrease natural moisture. We suggest applying a water-resistant lip product, like EltaMD UV Lip Balm before your morning cup of coffee to act as a barrier. 4. Avoid common lip balm ingredients like menthol, cinnamon, and camphor - at least until your lips are healed. Though these additives may have some benefits and produce a great tingly feeling, they can unfortunately worsen your chapped lips. 5. Exfoliate! Just like your skin, your lips need a little exfoliation from time to time. You can gently use a warm washcloth to buff away dead skin cells or an enriched lip treatment like gloMinerals gloExfoliating Lip Wand. 6. Look for ointment based lip products which create a barrier against dryness while repairing lips. Added SPF is also great! Brave Soldier Lip Defender SPF 15 is a great option due to its natural moisturizing beeswax, honey, Vitamin E, shea butter, and other natural oils. 7. Treat your lips while you sleep. Your skin goes through a renewal process at night, so slather on a thick balm or lip cream, like Avene Cold Cream Lip Cream, before hitting the sack. What other winter skin issues are you dealing with? Let us know!